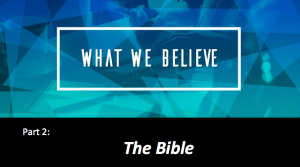 This week we will continue our series called What We Believe. Sunday, we will look at the great Commission found in Matthew 28:18-20. Then we will see how the apostle Paul carries out the great commission in a culture much like our own. If you’ve ever felt like you could do a better job of sharing your faith, this passage will encourage you. To prepare, read Matthew 28:18-20 and Acts 17:15-23. Tuesday, February 19th from 7:00-8:30pm at the Haupt’s house (1317 Conrad Lane). 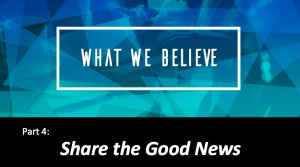 Last week we introduced this series with a look at the Christian world view. Christians do have a very specific way of viewing the world, life, God, faith, etc. And, this view is often, perhaps always, in conflict with the views of the world. I hope that you read each of these verses and consider what they are saying about the Bible. Tuesday, February 5th from 7:00-8:30pm at the Haupt’s house (1317 Conrad Lane).